I have a romanticised idea of meditation, and so this image matches perfectly some vision I have long held, without question, about what it might be like to meditate. Aside the health benefits of meditation, there is a pleasure absorbed simply by the surroundings, by the absence of people, society, haste and bother. Surroundings, those who have read any of my other posts may recall, matter greatly to me. Hence, my fondness for the countryside, for the heritage sector, for museums and galleries and the great glory of architecture that is common to our finest cathedral cities. But I digress. 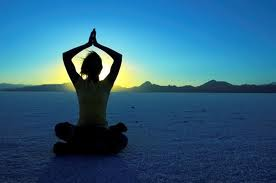 I have attended An Introduction to Meditation day, courtesy of Tracy Webb, a therapist specializing in meditation, the bowen technique, energy healing, yoga and counselling, amongst other areas of health and well-being. Here is a link to her site – http://www.bowen-nst.co.uk/About.html I had the privilege of attending a one day meditation course, with the promise to write about the experience and consider its impact and benefit. Tracy is based in Leamington Spa, Warwickshire, UK, and practices from The Warwickshire Wellbeing Clinic in Leek Wootton and also uses treatment rooms in Leamington Spa. It is always reassuring to meet a therapist who knows her subject matter, and Tracy has attended some rather brutal-sounding, highly disciplined meditation retreats and training, over a number of years. I am not sure that I could become that committed, but her knowledge base is sure and secure, and that inspires confidence. At times I have explored, tentatively, meditation and other holistic approaches to well-being, but must confess, I have not committed myself to any particular journey of discovery. Action, sport, the great outdoors, all feature highly in my world and my greatest desire, post the conclusion of all treatment for breast cancer, has been to be more active, to play tennis again in comfort and without fatigue, to go on great rambling walks and explore the countryside. Hence, I have had a slight reservation over the gains to be had by simply sitting, and being, in a small room, with a handful of strangers. I found this quotation which addresses my concerns rather well! Perhaps it is that fear of the extremes, that has led me to a very conservative and cautious approach to meditation. 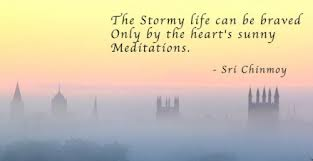 What pleased me about the day is the Tracy plans the practice meditations to be of varying length, so that some seemed only a few minutes, others 10 minutes, to a gradual progression towards meditating for a longer period of around 30 minutes. I can see that is very much a personal choice, but my preference has been for the mindfulness of breathing technique, and for insight meditation and the guided meditation, which I did most unexpectedly, enjoy greatly – a very fitting and lovely end to the day! When finished, let go of the counting and bring your awareness back to the room. When you have finished, take your attention away from your body and bring your awarenes back to the room. I would like to add to that, as your move your attention from the top of your scalp right down to your toes, you then begin the process backwards, moving your awareness up again through your body. I was initially impatient to move on (and get back again) but despite that niggling desire, I did feel remarkably calm and relaxed after this practice. In this time-starved life, where it seems every moment is to be measured and accounted for, I can more easily imagine myself meditating for periods of 15 – 30 minute duration, than committing several hours of each day to meditation. 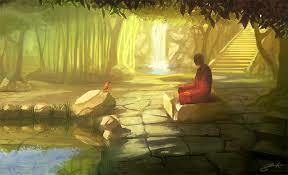 Finding a space and place to meditate may require a little thought. I like the idea of a simple, shrine-like space that is clear, devoid of clutter, light and airy, where nature merges in harmony with our material world. 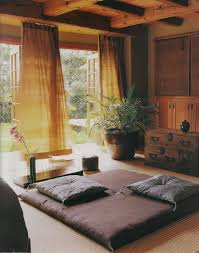 So, I have plans to re-arrange some of my bedroom space to find a visual, focal point for my meditations, that is pleasing and conducive to relaxation. Although I cannot say I am yet a convert, the appeal of meditation has grown, and discussing the day’s events with friends over the weekend, has caused me to think again about how much that need to find our own inner peace, is common to us all. Several days after my meditation experience, I can say that I have felt a calmness and serenity that I have not felt for some time. In truth, there may be many factors that have influenced that – good friends making time for coffee and mince-pies at the weekend, an unexpected visit from my son, pleasing business news and all manner of things that conspire to bring happiness into one’s life. But I revert back to my meditation day and feel that it has taught me a lot, and reminded me that it is always important to be alert to one’s well-being and to bring mindfulness back into everyday living. Those lessons really are invaluable. I am most grateful to Tracy and her Introduction to Meditation Day.